There are many places to fish in the Owens Valley all year long, but what so many anglers look forward to every year is the California general trout season. Opening day of fishing season, the last Saturday in April, is anticipated as eagerly as Christmas is by adults and children alike. “Fishmas” is a day like no other in springtime in the beautiful Eastern Sierra. Give the gift of fishing to your children (and yourself), celebrate the season, and enjoy a lifetime of happy memories. For all those who may not know how to start, where to go, and when to do it here are some best practice guidelines, resources, and tips and tricks to make fishing with kids fun, safe, and rewarding. We all know the saying, “You have one chance to make a first impression,” and this is oh so true when it comes to introducing kids to fishing. Their first experience can be a make or break experience that could establish how they feel about fishing for, possibly, the rest of their lives. The three most important things to do are plan, plan, plan! Whether you are an experienced angler or not develop your plan carefully and keep these basic points in mind when planning and executing your plan. No matter the age of your child(ren) make sure you peak their interest and make the first experience really, really fun. There can be a number of firsts in fishing: watch a fishing video together, look at the fish in a pond or river, go out on a fishing boat, buy some gear, practice baiting and casting in the backyard, go fishing! Fishing is about catching fish, but most anglers will agree that it’s also about the experience as a whole. The more fun and interesting it is, the longer the kids will stick with it. Don’t be disappointed, or let them feel as if they failed, if they don’t hook a fish the first time out. Don’t be concerned if they get bored or tired quickly. There will be a next time. Be attentive to their comments and needs and don’t allow frustration to set in. Make sure that they are comfortable, e.g. : wear the right clothing, apply sunscreen, have enough snacks and drinks, and keep a first aid kit handy. If it appears that the experience is going awry, then STOP! Nothing demoralizes a child more than feeling clumsy or incompetent. Adult-sized and complex equipment can wreck a child’s sense of confidence and ruin the experience entirely. An investment (even a small one) in gear and equipment specifically designed for children will reap long-term rewards. Check the weather reports and don’t try to make this a lesson in dealing with hardship – that’s a certain way to undo any willingness that kids will have for going fishing. Of course, a sudden change in conditions can present an opportunity to learn about the weather and should be handled in a safe, fun, and responsible way. It also helps to be near home, or your home-away-from-home like the campground or hotel, so that a return to familiarity and comfort is not too far away. The number one priority is for the kids to have fun! The very last priority is for you to catch fish. Perhaps you will, but remember … kids first, fishing second. With those thoughts in mind and perhaps a few beginning outings in your area, come visit one of the worlds most notable and beautiful fishing destinations. The Eastern Sierra is not just for experienced anglers. There are kids fishing events, guide services, and resources to get the best start and develop your budding angler into a fishing fanatic. There are innumerable places to go fishing, resorts where you can stay and play, and historical sites to see, to begin a lifetime of fishing fun with your children and/or grandchildren. Every year there are contests, festivals, fishing derbies, and opening days at numerous locations in the Eastern Sierra from Lone Pine to Bridgeport. Some are specifically designed for children and others have excellent opportunities for kids to fish with adult supervision. Others are great for improving on established fishing skills for youth and adults. The Early Opener Trout Derby in Lone Pine is held every first Saturday in March at Diaz Lake and is very well suited to fishing with kids. The annual Blake Jones Trout Derby in Bishop is one of the largest single day fishing events in California. It is held in late March and the 50th anniversary of the event was celebrated in 2018. The event is structured so that youngsters can participate successfully and enjoy the day, while even the most experienced anglers can make great catches. The annual Hot Creek Trout Fest in June and the Kids Fishing Festival in July in Mammoth Lakes are specifically geared to toward introducing kids to fishing and developing their skills for the future. Held in summer every year, the Silver Lake Fly Fishing Academy, in the June Lake loop area, is a three-day fly fishing event that is geared toward teaching youth and adults the art of fly fishing and developing an understanding of our natural resources and educating youth about stewardship. A major focus of the Bridgeport Trout Tournament is the children’s division where every participating child receives special attention. Fishmas is celebrated all up and down the Eastern Sierra with great contests for anglers to bring their catch in for weighing and prizes at many locations, including: Cardinal Village Resort, Tom’s Place Resort, Crowley Lake Fish Camp, Convict Lake Resort, June Lake Loop Chamber of Commerce, Gull Lake Marina, and Annett’s Mono Village near Bridgeport. Some events require registration or pre-registration, some have a fee to participate, and others are free, or simply offer the opportunity for you to weigh your catch and claim a prize at any time during the season. All these events and the services that support the fishing industry are family-friendly and children are encouraged to learn and participate. The furry family members are also welcome at many events and places. Please, as always, be respectful of others and leave no trace. Before you head out to one of these events find out more from the event organizers and check on all the rules and regulations. 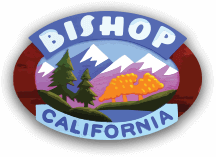 The friendly, helpful staff at the Bishop Visitor Center at 690 N. Main St. in Bishop have tons of info available about fishing, and fishing events, and can help you make good choices to suit your specific needs. Come in or call (760) 873-8405. The knowledgeable and experienced folks who live and fish in the Eastern Sierra can help you plan a fishing excursion or take you and your family out on a fishing trip that will be safe, fun and rewarding. There are many guide services that cater to beginners as well as experienced anglers, just bear in mind that longer and/or backcountry trips might be better suited to older children and adults. The sporting goods stores and outfitters carry something for everyone to build a basic kit or add to your tackle box. Staff at these outlets will have plenty of good information and advice to share so your first foray into fishing a fantastic one. If you want to take the kids out on the water there are any number of choices for boat rentals and you could even stay right on the water’s edge at many of the resorts. We have pretty long list of stores, services and places to go that include: Bishop Pack Outfitters, Lake Sabrina Boat Landing, Parchers Resort Cabins and Marina, Reagan’s Sporting Goods, and Sierra Bright Dot Fishing Specialist, among many more. Check out our list here to find what you need to get started and plan your fishing vacation in Bishop and the Eastern Sierra. It’s probably best to start out fishing with kids and beginner anglers at places where you are nearby to lodging, food and services. There are plenty of those near and even in Bishop. The canals that run in and around the town have been known to yield many great catches. A little further afield, less than 5 miles east of town, is the lovely lower Owens River that is open for fishing year-round. There are many points easily accessible by car for fun and easy fishing. The Buckley Ponds offer amazing warm water fishing including bass, bluegill crappie and are a beautiful feature on the Rawson Canal, which runs alongside the Owens River, and have handicap accessible piers that also make for very safe fishing conditions for kids. About 7 miles west of Bishop just off US Highway 395, on Sawmill Rd. is a super beginner fishing spot at the Millpond Recreation Area. The little lake has ample access for fishing and it also has a pier built out over the water for handicap accessible fishing. Swimming is allowed too. It’s a perfect starting point especially if some in your group are not going to participate in the fishing. There is plenty of parking and amenities include restrooms, picnic area, and a playground. Pleasant Valley Reservoir and the Owens River that runs out from the dam and across the plains below Chalk Bluff are superb fishing destinations. Here too, just like elsewhere along the lower Owens River, fishing is allowed all year long. The reservoir is a little more than 8 miles from the center of Bishop and a nearby campground serves as the perfect base for your fishing vacation. You could fish right outside the door of your RV or tent, or take an easy walk to any number of nearby fishing spots along the tumbling stream of the river, or the broad still waters of the reservoir. Where there’s water there’s fishing, and none so wonderful as the streams and lakes of Bishop Creek Canyon. This is the jewel in the crown of fishing near Bishop and offers world-class fishing for everyone. Three large lakes, the smaller Intake II reservoir, still smaller lakes and ponds situated along the burbling streams that form a latticework of water are just asking to be fished. Bishop Creek Canyon has more opportunities for lake and stream fishing than you can shake a fishing rod at. Services, boat rentals, and restaurants are situated alongside the larger lakes, Lake Sabrina and South Lake. The slightly more remote North Lake has a small campground nestled in the woods and many other campgrounds and resorts are dotted along the roads up through the canyon. Bishop Creek Lodge and Parchers Resort are tucked into this magnificent high Sierra setting and offer just about everything you could want in a wilderness-style fishing vacation. It truly is an angler’s paradise and there is no shortage of services, help, access and accessible options here. Countless places along the creek between the lake, situated at 9,600 feet above sea level, to the trail along Lower Rock Creek that ends at the small settlement of Paradise, are open for fishing during California trout fishing season. Rock Creek Lakes Resort has wonderful amenities that include a store, grill, cabin and boat rentals, and shower facilities all in a family friendly atmosphere. The canyon also has magnificent hiking trails with access to backcountry fishing opportunities. This is a superb fishing lake with equally superb facilities. A paved path runs along the eastern side of the lake and includes a wheelchair accessible fishing pier for close, easy access to the water. This path forms part of a large loop path, which has a wooden boardwalk that weaves through the aspen groves at the southern end of the lake. Convict Lake Resort supplements the regular weekly fish stocking done by the California Department of Fish and Wildlife (CDFW) during fishing season and anglers seldom take long to make their quota. Crowley Lake, 28 miles north of Bishop on US Highway 395, is one of the largest bodies of water in the area in which to fish. It is also one of the few places where you can drive up to the water’s edge and camp along the lakeside. Fishing is only allowed during trout season and the Crowley Lake Fish Camp offers rental cabins, camping, boat rentals, a grill, and guided lake trips. The list of fishing spots, and places where great services are offered to make a dream fishing getaway come true, is almost limitless. There are miles and miles of river and streams, ponds and lakes too numerous to count, with visitor centers and services for fishing all along the 150 miles of US Highway 395 from Lone Pine and Bridgeport. 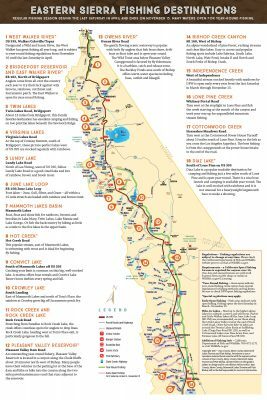 Download this handy map that will help you find your way around and get a great start on a lifetime of fishing in the Eastern Sierra. A large part of your planning will cover preparation, some practice, kids gear, and safety. One of the most frequently asked questions is, “What is the best age start kids fishing?” The answer is not a simple one as it depends quite a bit on the character of the child and how much patience you have. With the right plan of action kids can begin fishing at a very early age – as young as 3 years old, but 5 – 6 years old is ideal. 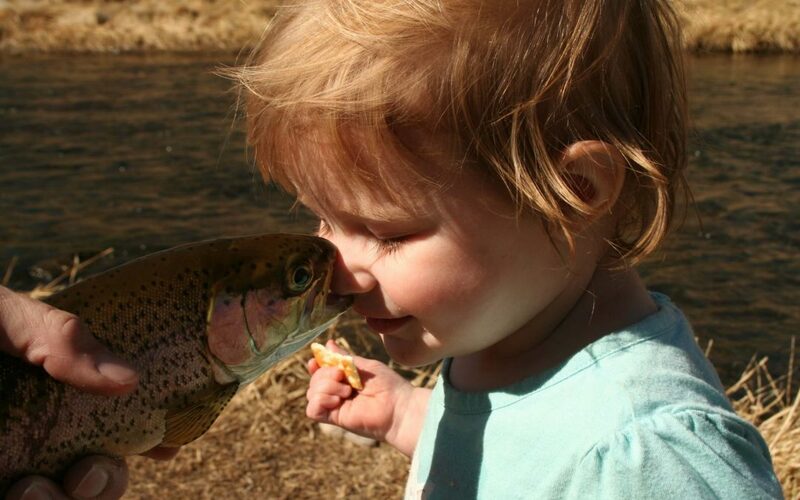 Toddlers can simply enjoy walking around a pond or lake with you and watch others fishing to encourage some interest. They can also have fun with a makeshift ‘rod’ and pretend to fish in a play environment in the home. If you are an experienced angler and your toddler has watched you fish, they are likely to pick up some basics fairly quickly and easily. A few minutes of fishing fun each time is sufficient for kids under 5 years old. It is vital, and can’t be stressed enough, to get gear that is made for kids. A shopping trip with your child(ren) can be part of the fishing experience (it is for you when you buy your gear) so let the kids learn how to make good choices here too. Rods for kids are designed with fewer moving parts and are shorter and lighter. Buy a rod that is really made for fishing and not one that is intended solely to promote a current action hero or princess doll. The difference in cost will not be much more, but the difference in usability is great. A good quality kids fishing rod will be soft and flexible, which makes it easier to cast and less likely to knot. A closed-faced spincasting reel is often the best first choice as the enclosed fishing line is less likely to get tangled up. These are button operated and easy for small, less dexterous hands to handle. If your child is left-handed be sure to have a reversible handle. Lures should be small and inexpensive and, remember, you’re probably going to lose a lot of them – so have a good stash and don’t let the loss be an issue. Bait is an item that should be well thought out. Live bait can be disturbing for some kids and the hooks required for live bait have sharp barbs that could cause injury. Discuss choices with an experienced angler or fishing store clerk and explain the choices to your kids so they feel involved in the process. Spend some time at home getting know the equipment and learn the basic casting techniques – the overhead and sidearm casts. Play a game in the backyard where a target is set out to try and drop the lure into the target. A brightly colored hula-hoop makes a great target on a green lawn. Learn to assemble and disassemble the kit and care for the equipment. An approved life vest is essential when fishing from a boat, but also highly recommended to be worn anywhere near water. Discuss all the aspects of safe gear use, especially being aware of surroundings when casting so as not to poke or hook someone or something unintentionally. Safety measures should include packing appropriate clothing and shoes, wearing sunscreen, a hat, and polarized sunglasses. Water, food and snacks are also a factor of safety as well as the yummy goodness of a fun day out. The modern story of fishing in the Eastern Sierra goes back over 100 years. Long before the Euro-American pioneers showed up in the region, in the mid-1800s, in search of possible riches from mining and fertile lands for farming – the lakes and streams of the high Sierra above 6,000 feet were fishless. When these settlers arrived they moved the native trout, which were a food source for them, into fishless drainages and upstream above waterfalls. Later as sport fishing grew in popularity more fish, both native and non-native, were introduced into the high lakes and streams. The result has been both positive and negative for the region. Fishing opportunities abound and this has contributed significantly to the economy of the region. However, the ecological balance has been upset and a number of native fish, amphibian and invertebrate species have declined and some are now federally-listed threatened species. Today the practice of fish planting is highly regulated and managed by the California Department of Fish and Wildlife (CDFW) and fish hatcheries produce specific species and quantities for sustainable planting. Three trout hatcheries in our nearby region, Black Rock, Fish Springs, and Hot Creek raise different species and visitors are welcome to tour the facilities and learn more about the fish and fishing in the region. The historic Mt. Whitney fish hatchery, located just north of Independence, is no longer an actively producing hatchery and is now a beautiful museum and wildlife interpretive center. This is a perfect place for kids and adults to learn more about the fish, participate in fish feeding, and understand the history of fishing in this area. The beautiful building is 100 years old and a visit to this historic venue is a perfect place to start your fishing journey with your children. Fish planting is done regularly under specific guidelines and regulations by CDFW to maintain healthy population levels for sustainable fishing in the region. The CDFW website has continually updated information on the stocking schedule and an interactive map about when and where fish are planted. Watching a fish plant is a fun sight to see and with just a little research and planning you might find one in progress to witness and perhaps have a quick chat with the CDFW staff doing the plant. In addition to the stocking done by the CDFW, many event organizers and resort owners in the region do supplemental stocking (per California regulations) so there are always plenty of fish to catch. Does a kid need a fishing license in California? NO! All anglers over the age of 16 are required to have a valid California Sport Fishing license. License categories range from 1-day to annual and prices vary for residents and non-residents of California. Catch limits are set based on time of year and specific waterways, with many periods and places declared as ‘catch-and-release’ only. There are a few waterways in the Eastern Sierra that are closed for fishing. Be sure you know the rules and regulations of the area you plan to visit and, if going into the backcountry, have a full understanding of what your responsibilities are. You won’t have cell service back there to get any answers from friends or the Internet. Two free fishing days a year are open to fishing without a license, but catch limits and other rules still apply. Free fishing days in 2018 are July 7th and September 1st. More information and updated dates for each year can be found on the CDFW’s Free Fishing Days webpage. With so much to do and so many options to get kids started with fishing let us help you find what you need here in the Eastern Sierra. Call us on (760) 873-8405 or come in to see us at 690 N. Main St. in Bishop and talk to us. 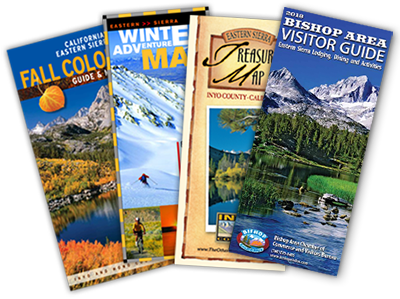 Our staff at the Bishop Visitor Center can answer questions, point you in the right direction, provide maps, and help you make good choices so that you and your family enjoy your time in our beautiful big backyard.